Galen Leather contacted me to see if I would like to review one of their new products, the Travelers Notebook leather insert. I have been using my insert for a couple of months now, the views in this post are entirely my own. The Galen Leather Travelers Notebook insert took me a little by surprise. The insert arrives in a simple kraft box with the basic Galen Leather information on the front. Inside you receive a notecard telling you who made your product and an all seeing eye charm. The presentation is special but kept very simple. Touches like these aren’t essential but they set the tone of a product. It suggests attention to detail and makes the receiving of something luxurious quite special. Honestly I was wowed when I actually felt, looked at and touched this leather insert. It's really beautiful. The leather is ever so slightly worn, with a smooth, soft texture that marks slightly to any rough touch. It's hard to convey how nice this insert in through the photos, when you have it in your hand and use it you really appreciate how good it is. Inside there is a lot going on. The left hand side has a whole load of credit card sized pockets, the top one being very deep. On the right hand side there is a zippered section and another long pocket. So there is a lot of space and room for things in this insert. There is also a secretarial pocket and a very clever pen loop with an elastic back section making most pens fit in here nicely. There is no question that everything about this insert has been considered carefully and finished really well. I can see why Galen leather chose to design something like this, its fits in with their existing portfolio of products and suits the growing(?) Travelers Notebook market. But does it work as an insert? I don't think the use case and positioning of this insert is 100% right. 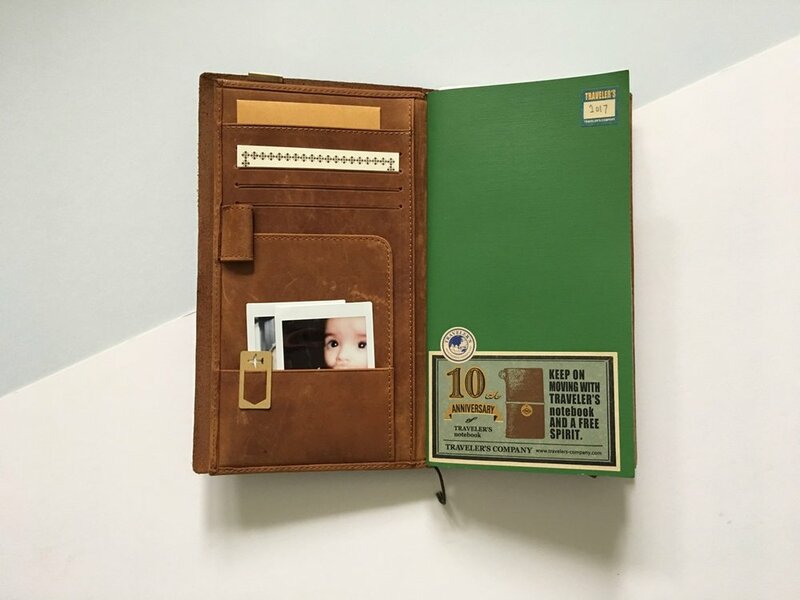 I have been using this as intended, as an insert in my Travelers Notebook that holds my weekly refill for journaling and my little one's journal. The issue is that the insert is thicker as the TN itself and when filled with papers, ephemera, stickers, book darts etc then the insert becomes very fat. Loaded up and in use for people on the move this insert would be one bulky burden. In its intended use, the Galen Leather insert isn't for me because it isn't really an insert, it's a standalone product. Moving forward I plan to use this with a Hobonichi Weeks for 2018. The Weeks is slightly smaller than a TN insert and will slot in nicely into one of the long pockets. I can carry a small amount of the things that I need and also slot a pen in so I have something with the Weeks at all times. This would also make a great travel wallet, but as an insert in a TN it falls short. There is no question that the Galen Leather Travelers Notebook insert really is very special. I was genuinely surprised when I opened the box, the leather is stunning and the hand stitched finish is really impressive. I like the fact that someone has personally created and taken care over my final product. I just won't be using this in my Travelers Notebook. I'd like to thank Galen Leather for contacting me and sharing their beautiful work.